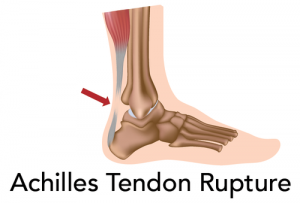 An Achilles tendon rupture is a complete or partial tear that occurs when the tendon is stretched beyond its capacity. Forceful jumping or pivoting, or sudden accelerations of running, can overstretch the tendon and cause a tear. An injury to the tendon can also result from falling or tripping. Achilles tendon ruptures are most often seen in "weekend warriors" – typically, middle-aged people participating in sports in their spare time. Less commonly, illness or medications, such as steroids or certain antibiotics, may weaken the tendon and contribute to ruptures. Rest: Stay off the injured foot and ankle, since walking can cause pain or further damage. Ice: Apply a bag of ice covered with a thin towel to reduce swelling and pain. Do not put ice directly against the skin. Compression: Wrap the foot and ankle in an elastic bandage to prevent further swelling. Elevation: Keep the leg elevated to reduce the swelling. It should be even with or slightly above heart level. These symptoms may vary in intensity, depending on the severity of the sprain. 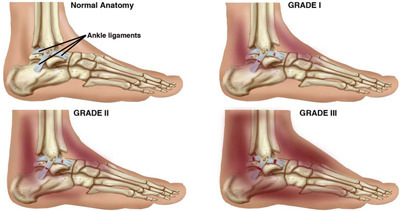 Sometimes pain and swelling are absent in people with previous ankle sprains. Instead, they may simply feel the ankle is wobbly and unsteady when they walk. Even if there is no pain or swelling with a sprained ankle, treatment is crucial. Any ankle sprain – whether it’s your first or your fifth – requires prompt medical attention. Compression: An elastic wrap may be recommended to control swelling. Early physical therapy: Your doctor will start you on a rehabilitation program as soon as possible to promote healing and increase your range of motion. This includes doing prescribed exercises. Medications: Nonsteroidal anti-inflammatory drugs (NSAIDs), such as ibuprofen, may be recommended to reduce pain and inflammation. In some cases, prescription pain medications are needed to provide adequate relief. Is a skin infection caused by fungus. A fungal infection may occur on any part of the body; on the foot it is called athlete’s foot, or tinea pedis. Fungus commonly attacks the feet because it thrives in a dark, moist, warm environment such as a shoe.